So, seems like I feel like going another round with a deck I quite very much liked last time I worked with it...the Swedish Witch. We have in this draw the Knight of Swords and the Ten of Wands - and rather strong a contrast, in terms of the mood and the color palette of the two cards. 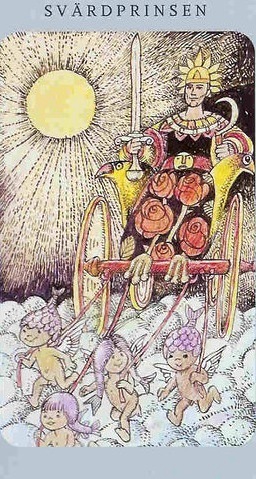 The knight moves forward over clouds, confidently seated in his chariot and pulled by so many angelic children with their little wings and bright purple hair. They seem to be enjoying the work, not yet seeing it as a burden. The knight has a sunflower-shaped hat and the real sun shining behind him, his sword held firmly upright. He charges forward, optimistic, excited, convinced of his purpose and his ability to fulfill it. Next to that, we have quite another scene entirely. 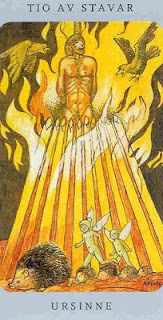 A bonfire, a pyre made of wands, and a man in the center of it, tied naked to a stake as he burns. 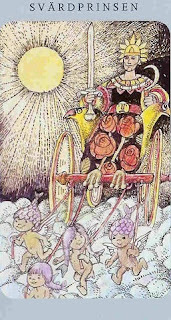 Whereas in the first card to two birds made up the side and handrests of the knight's mighty chariot, here they fly into the fire, into the same destruction that he is already doomed to. The fairies and hedgehogs are smarter, getting away while they can, preparing to start anew elsewhere. Will they learn a lesson from this, in the way that the man, the knight could not? Do the reading, it is mind-boggling how very much these two cards can be seen as representing the approach of the US military (and army in particular) to war. Military leaders that forged on into the conflict, supremely convinced that there methods were right, would provide a quick victory. Lots of soldiers and firepower had won WW2 had they not? They didn't listen to those who would say - but this isn't the same kind of war at all. They did not seek out advice or listen when it was preferred from other militarizes who had fought very similar conflicts quite recently. When things went wrong they refused to analyze why, refused any suggestion that there approach was not the right one. More soldiers is what we need, more purple haired children to send into the fray, so self-assured that they refused to even acknowledge the fire until far after the situation might be salvageable and how many on all sides had died...disaster, oppression, burdens. And then, US forces withdrawn, the Army proceeded to PURGE almost all the material on lessons learned from their training and curriculum. Why focus on what we did wrong when we can comfort ourselves with what we know we can do well, conventional wars against proper governments on terrain we like. The costs of refusing to see what you don't want to see, of not thinking through all possible scenarios, of not recognizing your own shortcomings, weaknesses, mistakes. So often it isn't only you that can hurt - moreso for leaders, sure, but even on a smaller scale. Not all disasters can be avoided, of course, but so too not all are inevitable. Great deck and great post. I think most folks rarely look beyond the end of their noses when making choices. Then when fallout happens, they look for an excuse or someone to blame. Like the little kid wanting dessert, their eyes are always bigger than their stomachs (or brains, lol).